playing Minecraft on the server by himself, with friends, or playing games. watching YouTube videos about Minecraft. 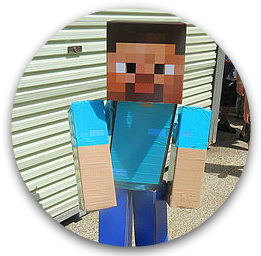 I strongly encourage Minecraft as a hobby for all of the obvious reasons (Like this, this and this.) Someone sent me this resource from Common Sense Media (also a great overall media resource) on child appropriate YouTube videos for those little ones who spend every waking moment watching YouTube videos on Minecraft. I hope you find this resource useful-I plan on going home tonight and building a YouTube channel so my nine-year-old can watch only age-appropriate content. Let me know your thoughts, and any kid-friendly Minecraft channels your family likes.